The Veery is an 18-cm-long bird with a reddish brown dorsum, white belly, gray flanks, grayish face, small spots (often indistinct) on the breast, indistinct grayish eyering, and straight slim bill. Western populations have a darker dorsum and more breast spotting than do eastern populations. Veerys differ from other thrushes by having less breast spotting (less distinct and more restricted). They differ from Pacific coast populations of Swainson's Thrush (Catharus ustulatus) in having gray, instead of buffy brown, flanks. Veerys breed from southern British Columbia east across southern Canada to Newfoundland, south to Oregon, Colorado, portions of the Midwest, and throughout New England south along the southern Appalachian Mountains to Georgia. They breed in appropriate habitat throughout Montana. They winter in northern South America. Summer Resident. 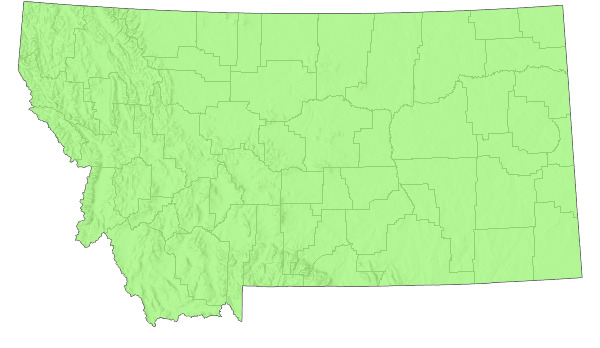 Earliest reported arrival date for Montana is 28 April at the north end of the Tobacco Root Mountains in Madison County, latest departure date is 13 September at Westby, Sheridan County (Montana Bird Distribution Committee 2012). In the Bozeman area, normal migration periods are from 22 May to 1 June and 25 August to 3 September (Skaar 1969). At Fortine, mean date of arrival is 31 May, earliest annual arrivals ranging from 26 May to 2 June (Weydemeyer 1973). At Missoula, average arrival is 23 May and departure is 30 August, with extreme dates of 18 May and 8 September (Hand 1969). Generally inhabits damp, deciduous forests in the east. Has a strong preference for riparian habitats in several regions, including the Great Plains. 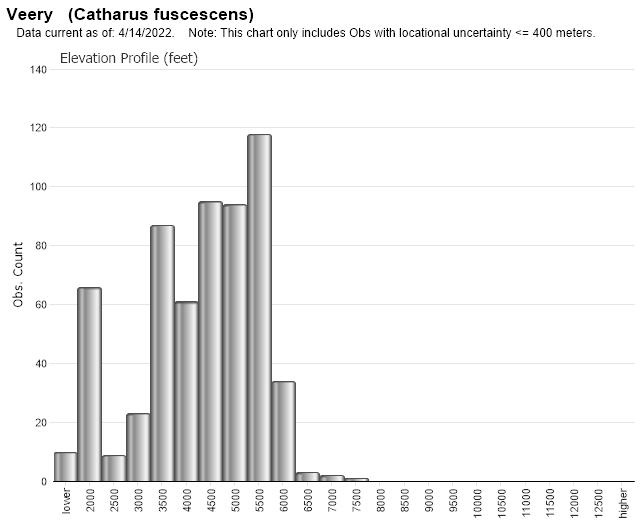 Prefers disturbed forest, probably because denser understory is not found in undisturbed forests (Moskoff 1995). In Montana, Veerys are often associated with willow thickets and cottonwood along streams and lakes in valleys and lower mountain canyons (Saunders 1921, Hand 1969, Skaar 1969), icluding the Flathead and Lewistown regions (Silloway 1901, 1903a). It also occupies riparian cottonwood stands along the lower Missouri River (Kroodsma 1973). Along Beaver Creek in the Bears Paw Mountains, Veerys were present in a variety of plant community types (box elder, alder, aspen, cottonwood, and lodgepole pine) so long as willow was a significant component (Walcheck 1969). The Veery is primarily a ground forager, with a diet including insects (60%) and fruit (40%), feeding primarily on insects during breeding and on fruit during late summer and fall (Maskoff 1995). A significant host for the Brown-headed Cowbird in many parts of the range of overlap, which is exacerbated as forests are increasingly fragmented. Cowbirds parasitized 40% of 10 nests monitored in riparian habitat of the Bitterroot Valley (Tewskbury et al. 1998). Breeding density in dogwood and alder along Elk Creek at Lubrecht Experimental Forest (near Missoula) was estimated to be 43.2 pairs/40 ha (Manuwal 1968). Classified overall as uncommon along the lower Missouri River, where it was observed in eight of 21 riparian cottonwood stands (Kroodsma 1973). BBS data indicate significant annual declines in numbers of 4.6% in Montana and 0.9% survey-wide from 1966-2009; there were also significant annual declines in numbers of 1.2% in Montana and 0.3% survey-wide for 1999-2009. 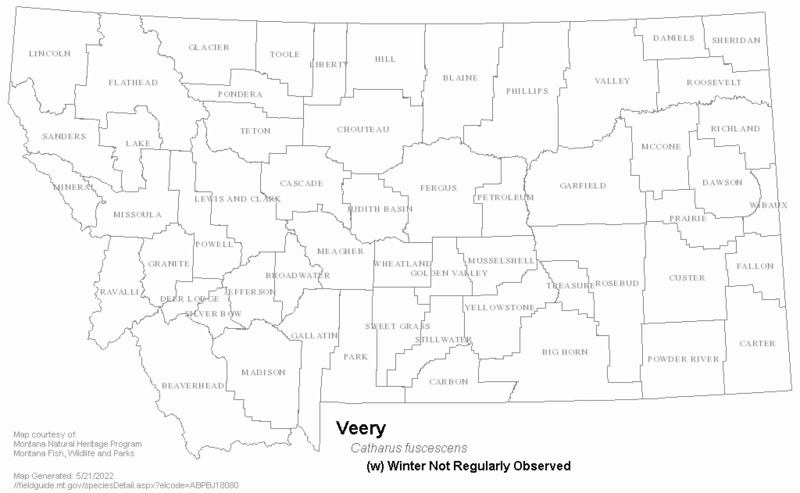 No management activities specific to Veery are currently occuring in Montana. Veerys are a fairly common cowbird host. Numbers may be significantly reduced in grazed areas and campgrounds compared to relatively undisturbed sites (Saab 1996). However, it may favor disturbed forests where the understory shrub layer is denser than in undisturbed sites. Heavy grazing apears to be more deleterious than light grazing (Mosconi and Hutto 1982). Preference for large riparian stands and susceptibility to cowbird parasitism make it vulnerable to landscape changes and disturbances (Casey 2000). Kroodsma, R. L. 1973. 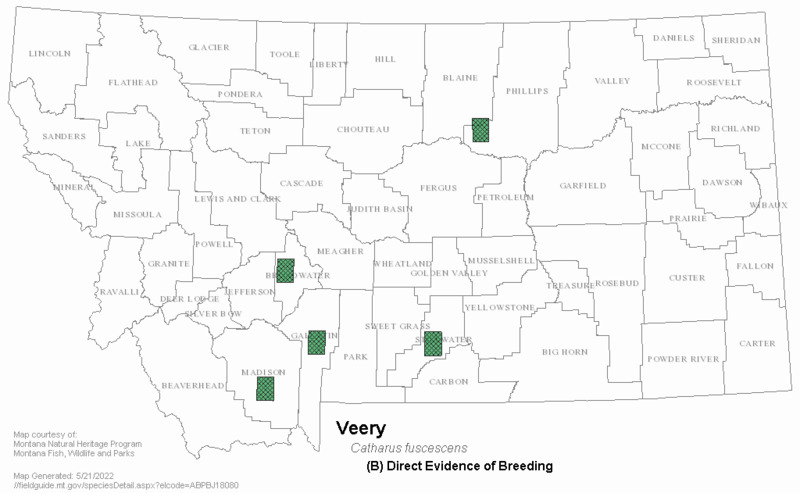 Breeding bird populations of riverine forests in eastern Montana. Prairie Naturalist 5(3):40-48. Manuwal, D. 1968. Breeding bird populations in the coniferous forests of western Montana. M.S. thesis. University of Montana, Missoula. 176 pp. Mosconi, S.L. and R.L. Hutto. 1982. The effects of grazing on the landbirds of a western Montana riparian habitat. In: J.M. Peek and P.D. Dalke eds. Wildlife-Livestock Relationships Symposium. Forest Wildlife Range Experimental Station, University of Idaho, Moscow. p 221-233. Saab, V.A. 1996. Influences of spatial scale and land-use practices on habitat relationships of breeding birds in cottonwood riparian forests. Ph. D. thesis. The University of Colorado, Boulder. Silloway, P. M. 1901. Summer birds of Flathead Lake. Bulletin of the University of Montana No. 3, Biological Series No. 1. 83 pp. Silloway, P. M. 1903. Additional notes to summer birds of Flathead Lake, with special reference to Swan Lake. Bulletin of the University of Montana No. 18, Biological Series No. 6. 293-308 p.
Silloway, P. M. 1903. Birds of Fergus County, Montana. Fergus County Free High School Bulletin No. 1, Lewistown, Montana. Tewksbury, J.J., S.J. Hejl, and T.E. Martin. 1998. Breeding productivity does not decline with increasing fragmentation in a western landscape. Ecology 79(8): 2890-2903. Walcheck, K. C. 1969. Avian populations of four plant communities in the Bearpaw Mountains, Montana. Proceedings of the Montana Academy of Sciences 29:73-83. Weydemeyer, W. 1973. The spring migration pattern at Fortine, Montana. Condor 75:400-413. Bertin, R.I. 1977. Breeding habits of the wood thrush and veery. Condor 79: 303-311. Dilger, W.C. 1956b. Adaptive modifications and ecological isolating mechanisms in the thrush genera Catharus and Hylocichla. Wilson Bull. 68: 171-199. Johns, B. W. 1993. The influence of grove size on bird species richness in aspen parklands. Wilson Bull. 105: 256-264. Noon, B.R. 1981. The distribution of an avian guild along a temperate elevational gradient: the importance and expression of competition. Ecol. Monogr. 51: 105-124. Tubbs, A.A. 1980. Riparian communities of the Great Plains. Pages 419-433 in Management of western forests and grasslands for nongame birds. U.S. For. Serv. Gen. Tech. Rep. INT-86. Web Search Engines for Articles on "Veery"